This year, I’m picking the Louisville Cardinals to win it all. Yes, I know they’ve defeated my beloved UCONN Huskies three times this year (including a Kevin Ollie ejection, a 33 point loss and the inaugural AAC championship game), but they’re playing good basketball and I think they could go all the way. No matter what happens, I’ll be glued to the TV and my bracket (which will likely be busted by Thursday evening) all weekend. This is my favorite time of year! I’m not alone, though. Marketers love this time of year as well and I’m seeing basketball themed advertising on the television, popping up in my Facebook newsfeed and everywhere else I look. I’ve been prompted to fill out NCAA brackets by just about everyone. I’ve heard from Buffalo Wild Wings, my local NBC affiliate, and most dramatically by Quicken Loans who is offering the chance to win a billion dollars. A number of writers have already established why you won’t win a billion-dollars, but it is easy to see that these brands are winning big by banking on bracket gimmicks and piggybacking on all of the basketball fever in the air. Quicken Loans will never pay out a billion dollars (they’ve insured the payoff with Berkshire Hathway) but they could end up being big winners themselves. Individuals who would like to test their luck and fill out a bracket are asked to provide their contact information along with the interest rate on their mortgage. 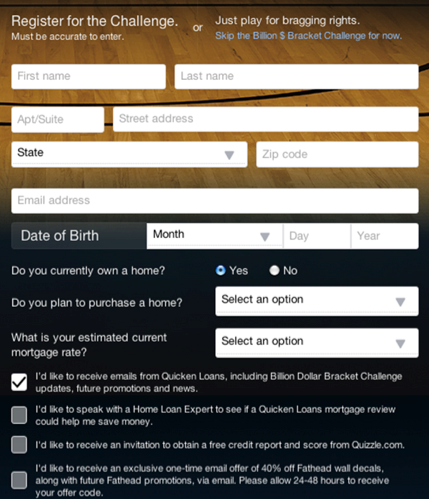 Leads like this might normally cost Quicken Loans $50 – $300 making this a valuable campaign for them, especially considering how much earned media the gimmick has garnered. It is certainly an exciting time of year for sports fans and marketers alike. Those brands that have figured out how to create their own “shining moment” may achieve great results. Is your brand making the most of March Madness and what do you think of all the marketing surrounding this event? What do you think about ambush marketing and are brands pushing things too far? Most importantly, who did you pick in your bracket this year?